I’m not the first person to use cards instead of dice, but I’d like to think that the potential of cards as a resolution mechanic is still relatively unexplored, especially compared to dice. In my previous article, I talked about how cards are more tactical than dice. After releasing Mythic Mortals, let’s talk about some other cool card-based games. Kickstarted WAAAY back in February, this was a game that had the largest influence on my initial design. I was captivated by the idea of cards as your character sheet, and knew that I wanted to do something similar. 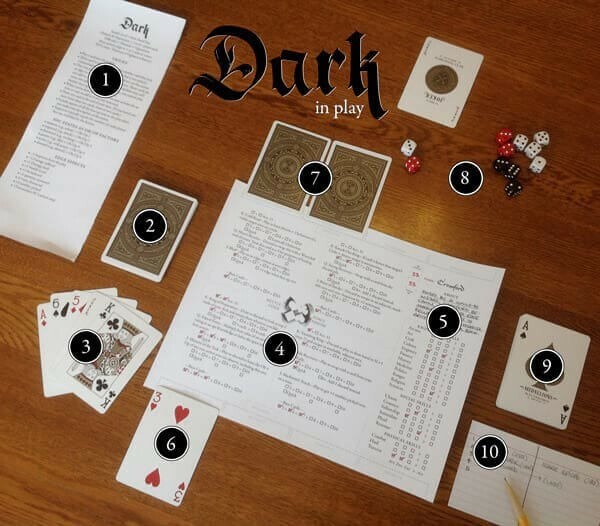 Dark is a little more complex than I liked, and the beta document was very difficult for me to understand. It’s a stealth game a la thief where your hand of cards increases and decreases depending on your stealth level. Players must choose to have more options and remain hidden, or be more mobile but reduce your choices. There are a lot of additional bonuses and strengths for different characters, which adds some fun abilities and variety. Hopefully the final document will be more streamlined, or my brain will finally have evolved enough for me to understand it. This is actually a very recent game, and was kickstarted just as I finished the closed beta for my own game. If I had seen this earlier, it might have drastically affected my direction and motivations for making my game; but as it stands, it’s a REALLY interesting resolution mechanic that I will definitely steal for use in future games. Here’s the main thing I wanted to offer with cards: choice and strategy. Giving the players the freedom to decide when to play high cards and when toy play low cards is a really neat idea, and once I tried to capture with a constantly shifting character sheet of cards. You must spend ALL of your cards before you re-draw your hand. 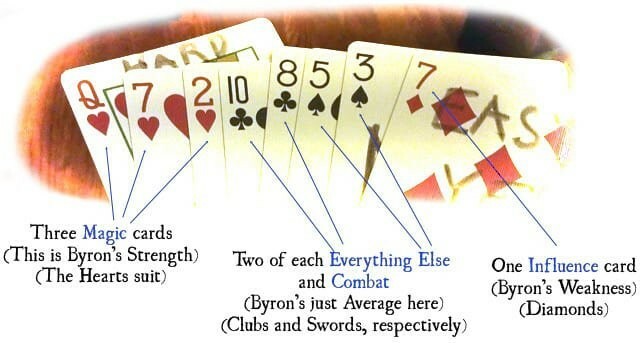 So for the example hand above, the player knows that he will have to fail at 2 tasks (the 2 of hearts and 3 of spades). But the player CHOOSES what they fail at and what they succeed at. It’s brilliantly simple while leaving a lot of choice for the players to influence the story. This was the first game I read that used cards instead of dice. I remember being intrigued by the idea, but since all players draw from the same deck, it was more of a controlled randomness than a mechanic to reinforce player choice. Still, a lot of interesting stuff going on here, and it’s free! I love dice-based resolution mechanics, and my constant reliance on Dungeon World as a system is a testament to that. Cards are like pre-rolling dice, and you get to choose when you fail, and when you succeed. I’m excited about the potential for more card-based games that give players more control over how the impact the story, and how game developers will use the tactical randomness of cards against the percentages of die systems.